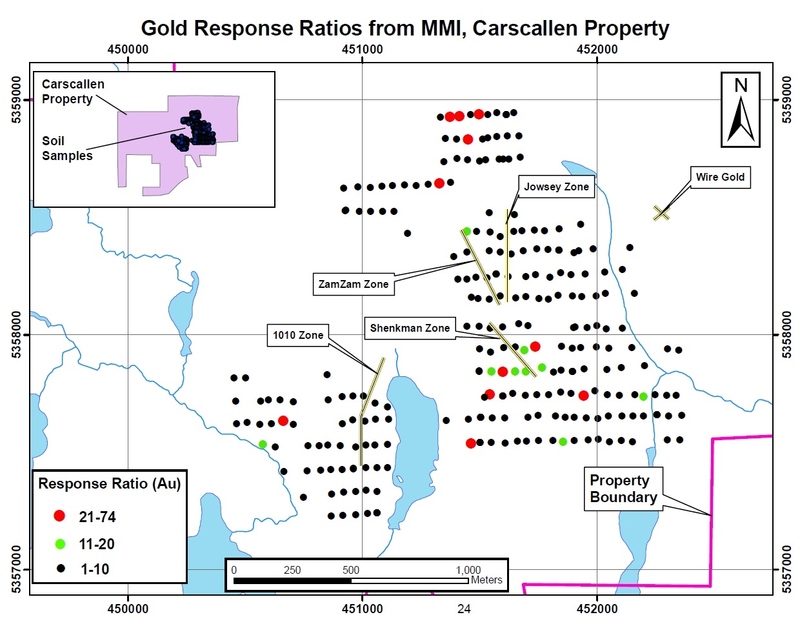 Current work consists of a comprehensive surface exploration program over the remaining property including the 1010 Gold Zones, Shenkman/Mystery showing and Wire Gold showing. In addition previously detected chargeability anomalies peripheral to the Jowsey Gold Zone will be investigated. Old workings have been located in close proximity to some of these anomalies and will be sampled. A beep mat survey will be done to identify new areas of interest related to the chargeability anomalies. In addition, anomalous soil samples taken in 2009 will be investigated. In the 2009 survey, a total of 255 soil samples were collected for Mobile Metal Ions analysis (MMI) and 227 traditional B-horizon soil samples were collected and submitted for Au and multi-element geochemical analysis. Anomalous areas from the previous survey will be prospected and sampled and additional soil samples will be taken to verify the size and possible source of these anomalies. To view the image associated with this press release, please visit the following link: http://media3.marketwire.com/docs/1018629_MAP.jpg. Exsics Exploration has been contracted to perform line-cutting and an Induced Polarization survey on the Big Marsh Property located about 5 km to the north of the Carscallen property. Additional drilling will be based on the results of the above programs.